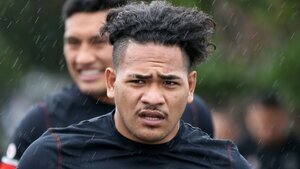 New Zealand Warriors centre Solomone Kata has made a strong start to his international career with the Kiwis, holding down the left centre spot in the opening two Tests of the 2016 end-of-year campaign. We caught up with the 21-year-old powerhouse to see how he is fitting in to the camp and the style of international rugby league. KLC: How have your first few weeks as a Kiwi been? SK: It has been pretty good, the boys and staff have made me feel very welcome to the team and it has been awesome. There isn’t much difference compared to an NRL away trip, it’s the same stuff with jokes, the same personalities. You grew up in a tiny place in Tonga, and even Auckland isn’t big by international standards, so what has it been like going to huge cities like London and Manchester? In my first year I wasn’t comfortable with that stuff at the Warriors and it has been the same thing when I first joined the Kiwis. It took me two full days in England to feel comfortable with the boys, but they were good in terms of making you feel welcome, and I also had the Warriors boys here with me. The time difference has been the hardest part, it took me a whole week to get my body right and at first I was waking up about four times every night. But now it’s OK and I am back to normal, it’s hard to get up! In what ways do you find Test football different to an NRL match? The physicality, it’s more physical and mentally it’s tougher because you are facing all of the good players and they just keep coming. It is harder than the NRL in those ways. You played in the sold-out Four Nations match in Huddersfield, what was that atmosphere like as a member of the team playing against England? Yeah it was amazing, it was the loudest crowd I have played in front of so far. You have all of the crowd noise and then there are people playing drums, other instruments and singing their own songs. It would be a great environment to be in if you are from England, but it was pretty crazy and on the field you couldn’t really hear anything. It looks like you have been able to gel pretty quickly with Jason Nightingale on the left edge, particularly in defence, have you been pleased with that aspect? I have, in my position I am the main man defensively, if you make the wrong choice then the winger is forced to as well. The winger is a mirror to you and the talk between Jason and I has been good. It has been pretty good working with Jason, the main focus for a centre is always how you combine with your winger and work from the inside defensively. You have come in with a new coach in David Kidwell, how have the early stages been with him? ‘Kiddy’ is really good, I am enjoying being coached by him and being around him in England. We have a lot of jokes about him and we have fun, but on the training field all of the boys know that there is no more of that, that it is serious and we all have to act the same.